Happy Sunday! I hope you are all having a brilliant weekend. Today I wanted to share with you my thoughts on the Irish skincare brand Kinvara. 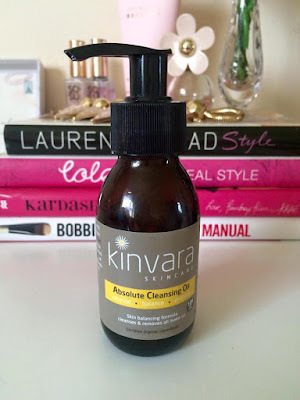 If you follow Suzanne from SoSueMe.ie and Grace from FacesByGrace.com which i'm sure you do, well then you've definitely heard of Kinvara Skincare. The girls are huge fans of the brand and after trying the products myself for over a month now I can completely see why. The Absolute Cleansing Oil as the name suggests is an oil. It is suitable for all skin types including very sensitive and oily skin. I have very sensitive skin as a lot of you will know I suffer with eczema and do get it on my face from time to time. I always have to be very careful with what products I use on my skin but when I heard the reviews on this particular brand, I just had to try it. 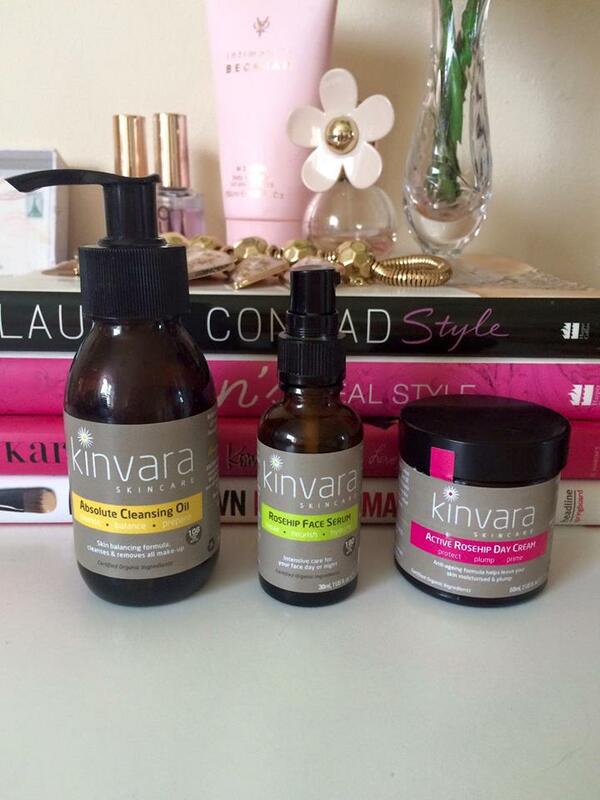 All Kinvara products are free from parabens, artificial colours, fragrances and SLS. They also were not tested on animals so this gets a huge thumbs up in my book first off. This cleanser cleanses, restores and balances the skin. Removing all heavy make up with only one pump. A little of this product goes a long way so one pump for me is plenty. I wear make up every day so when it comes to removing a really good cleanser is just what I need. Before using this cleanser taking my make up off was a chore but now its a treat as I feel like I get a professional facial twice a day. My skin feels silky soft and moisturized after cleansing not like some other cleansers or make up removers where your skin feels tight, dry and striped. I have also noticed the oil balance of by skin has improved and my pores no longer look so large and open. 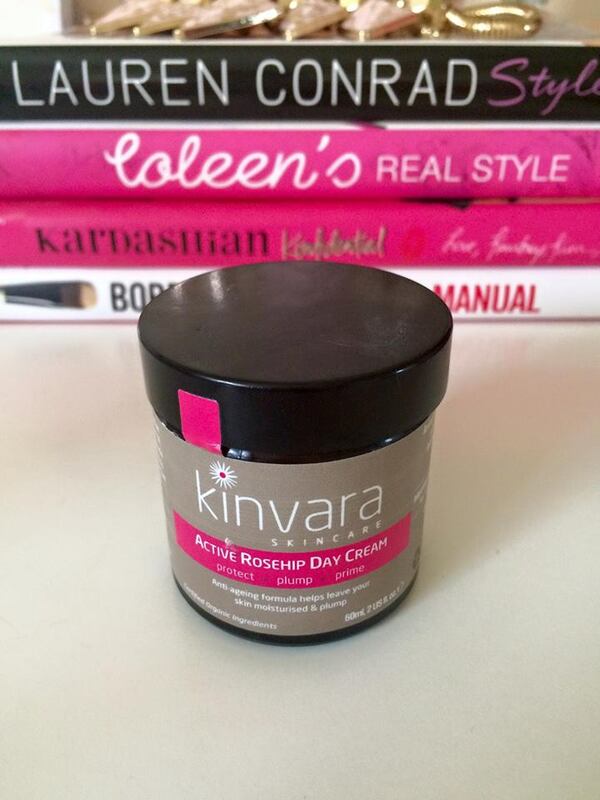 I love all three Kinvara products that I have tried but this is by far my favourite. It smells gorgeous, so rich and luxurious. It feels like i'm in a spa every time I smell it. It repairs the skin, nourishes and hydrates. It is rich in antioxidants, essential oils and high amounts of vitamins. I also use this twice a day and my skin is so hydrated and nourished. I love using it in the morning, it really wakes tired skin up leaving it feeling refreshed and rejuvenated. When I use it before bed I feel like my skin is getting a deep pampering session and I wake up to plump, hydrated, clear skin. I have been using the Kinvara Rosehip Day Cream twice a day too. Just to give my skin an extra little treat. It smells of lavender oil. It is extremely moisturizing, it projects, plumps and primes the skin. It drys in quickly so you don't need to wait to long to apply your make up. It is an anti-aging formula enriched with omega rich plant oils, regenerating plant oils and vitamins. I studied Aromatherapy in college. 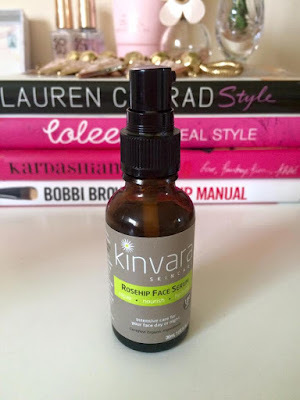 So I just had to look up what ingredients Kinvara Skincare used in their products. I was highly impressed. In my opinion Kinvara Skinare are one of the best brands on the market today. Kinvara products are available to buy online, in most health shops and Foody's Pharmacy in Ballina in Co. Mayo and Dublin.